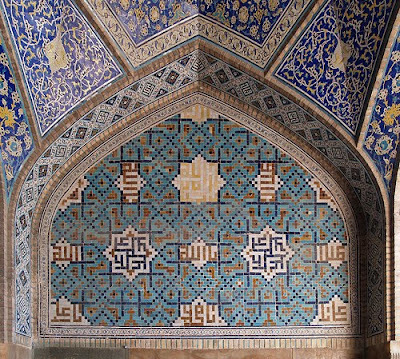 Above is Art work from Mukhtar Sanders and Soraya Syed - called Kufic Maze. It was exhibited in 2005, along side my own work in ”PSP The Beautiful Script” exhibition encompassing the world of Arabic calligraphy and geometry. The exhibition was in London. 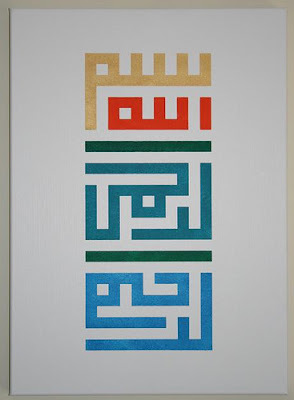 The Kufic Maze is entered through the word ‘raghba’, meaning desire in Arabic. 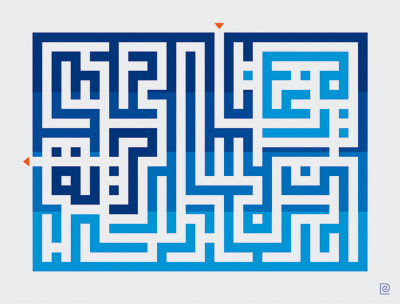 The shortest pathway through the maze, makes-up the Arabic word ‘jamal’ meaning beauty while the exit is made through the word ‘hurriya’ meaning freedom. 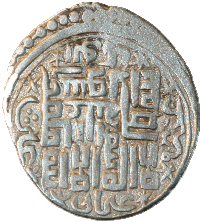 This form Arabic script i have always found mesmerizing, even from early childhood, and even more now as it can be translated into a digital qualities, as 2D barcodes that hold information inside the image. Here is a comparison I have found, between the ancient and modern code. The left and right separated by more than a millennium. 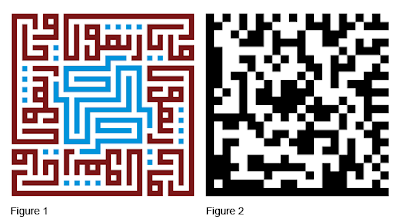 Its only a matter of time, when we can each have our own Kufic Logo, and have hidden information or code inside it, and with a click of a mobile phone, you can access to knowledge. But man its not easy making them... Remembering back when both me and my wife tried to make our own it was hard following the strict Rules - In the end we could not fit our names in a Square, so knowing nothing can be perfect accept God we were both happy with a rectangle. 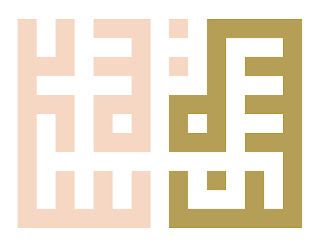 Ruh Al-^Alam from ( www.visualdhikr.com ), also tried his hand at our logo, but in the end we went with our one. But his attempts were cool also.